The recent comments from Jonny on the Tusk are some of the most insightful internet analysis anywhere regarding the orbit of Comet ISON and somewhat related matters. I recommend the developing thread to anyone who cares to stand in awe of intelligence beyond our own. 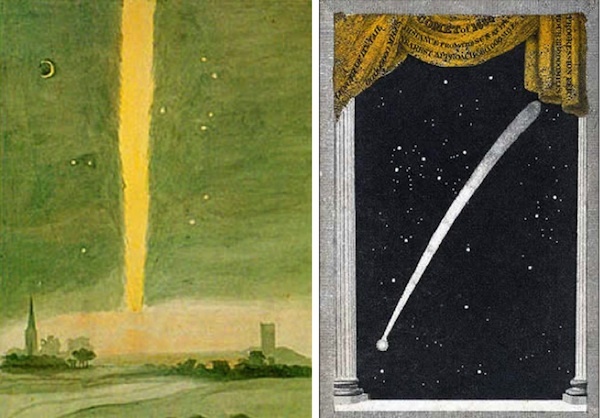 The painting on the left, by the 17th century Dutch painter Atlas van Stolk, depicts the famous comet of 1680. The nighttime view of it on the right was drawn by a contemporary English observer. The comet was bright enough to be visible during the day. Image credit: www.jwwerner.com. George, if you check out the JPL small body database for ISON http://ssd.jpl.nasa.gov/sbdb.cgi#top, you will see that its eccentricity is determined to be more than 1. This means that it is parabolic/hyperbolic, and hence does not have an orbital period (hence the n/a next to “period” in the data. Thus it is meaningless to talk about what the period of this comet would be, and it is extremely unlikely that its period is 10,000 years. Indeed having an eccentricity larger than one means that it will exit the solar system never to return, unless it interacts with a planet or two to change its eccentricity to less than unity. Non-gravitational forces from out gassing could also accomplish this (or even increase its eccentricity further). Arriving into the solar system with an eccentricity greater than 1 means that this is likely the first visit of the comet to the inner solar system. Its orbital elements are extremely similar to the comet of 1680 http://ssd.jpl.nasa.gov/sbdb.cgi#top, and the suggestion by one researcher that this is not coincidental, and that ISON and C/1680 V1 are perhaps were part of the same object. Although it passes close to the suns surface, it is not thought likely that it will impact the sun. Great stuff, as always, Jonny. Yes, late night typing can greatly effect the coherency of one’s posts. I shall try to elucidate a bit more. For those who have not heard of orbital elements before, one can define the orbit of a body about the sun with using 6 parameters. These parameters are the eccentricity (e), semi-major axis (a), inclination (i), Longitude of ascending node longitude of the ascending node (node), argument of perihelion (p) and the mean anomaly (M). I have used the notation of jpl small body database. These parameters will tell us the shape and orientation of an orbit in space (to know where a body is at any given time we also require the time of perihelion). You can visualize what each of these parameters refer to herehttp://en.wikipedia.org/wiki/Orbital_elements. You can see the close similarity of inclination, argument of perihelion, and mean anomaly, which has lead some to suggest that ISON and C/1680 V1 may be siblings from the same parent (especially when one considers these are two sun grazing comets, with similar perihelion distances). Will ISON collide with the sun at perihelion? Its not likely, since C/1680 V1 passed the sun at 0.006 AU compared to ISON’s distance of 0.0125 AU from the centre. That is, ISON will be twice as far from the sun as C/1680 V1 and it failed to collide with the sun. Will it survive perihelion? No-one knows, but we are all hopeful it will so it can put on a magnificent display. With regards the link http://sywardus.wordpress.com/2012/12/18/comet-ison/. There are a number of problems with the hypothesis. The author of the article has proposed that there is a 333 year periodicity between specific events and associated with Comet ISON and C\1680 V1 (AKA the great comet of 1680). It is true that the two above comets have similar orbits, and if we do a reduced D-criterion analysis of the two orbits, which compares the orbits of two objects via their perihelia, inclination and eccentricity we obtain a value of 0.021 (the closer to zero the more similar the orbits and the more likely the two objects are dynamically related). To put this into context, the D-criterion of Taurid Complex meteors with their progenitor is typically 0.04, so the analysis for the two commentary orbits would imply a greater similarity than the orbits of Taurid meteors and their known Parent body. If we assume that the two comets are dynamically related, then it is possible that they are the fragments from a shared progenitor. Would the two comets be the same comet, observed 333 years apart? Well for this we will put Newton and Kepler in the driving seat. The comet of 1680 upon leaving the solar system had an almost parabolic orbit, but crucially it appeared to have an eccentricity less than 1. This means that it is bound to the sun, and will be periodic. Indeed, its semi-major axis was determined to be around 444 Astronomical units. Using Kepler’s third Law (Square of the period is proportional to the cube of the semi-major axis), then we can determine C\1680 V1’s orbital period upon leaving the inner solar system. If 1 AU corresponds to 1 year, then 444 AU corresponds to a period of 9355 years. I.e., if the comet returns, it wont return to perihelion until sometime in the 12th millennium AD. Unfortunately I don’t believe that observations were precise enough to determine if C/1680 entered the solar system on a e > 1 orbit, and was perturbed into a bound e < 1 orbit. But assuming that it is indeed periodic, it would have last visited in the 8th millennium BC. This 9355 years for C\1680 is where I imagine you got your 10,000 year orbit for ISON. There is no chance that ISON and C\1680 are the same object, and especially one with a period of 333 years. ISON’s orbital elements suggest that it is a new visitor to the solar system. Also to suggest that there were at least 4 fragments of the same body, all separated by 333 years seems like a case of special pleading. What about the speculation that C\1680 caused an outbreak of the plague? Lets assume like good catastrophists that there is indeed a link between the comets and disease. The closest C/1680 came to earth was 0.42 AU, which is about 63 million kilometres. Also, C/1680’s ascending node (the point where the comet would cross the ecliptic from below) is outside the earths orbit, meaning that its tail would be downwind from the earth. Also at this point, the earth was about 0.62 AU away. Thus it is extremely unlikely that there was any interaction between the comet and the Earth. As we established above there C\1680 is not likely to have had a 333 year period, but lets examine the 333 year periodicity with respect comet Negra of 1347. You will be aware of course that Mike Baillie has highlighted the coincidence of this comet with claims of a corrupted atmosphere, and a possible link with the black death, which Mike outlines in “New Light on the Black Death”. Lets take this at face value, and say that The Black Death was comet induced. If we go back 333 years, we end up at 1014 AD. It is strange how this date has become an “impact date”. The original suggestion of this date as an impact date comes again from Mike’s “New Light on the black death”, in which he notes that in the GRIP ice cores elevated ammonium around AD 539 and AD 1014. Given the argument for impact at AD 539, it was reasonable to assume under this paradigm that the AD 1014 signal could have been impact related also, especially given the apparent coincidence of the St Michalmas flood. Ted Bryant and Dallas Abbott seemed to have taken this date and ran with it, and found evidence for a comet impact at AD 1014. However, if we examine GRIP critically we see certain flaws. For a start the AD 539 peak is wrong. The ice core workers of GRIP have admitted that the data for this section of the core as published online is wrong, and should never have entered the public domain. The dates given in this section of the core are not genuine counted layers, but rather dates extracted from ice flow models. If one were to count the physical layers, one finds that the NH4 spike occurs around AD 546, i.e. 7 years later. We also have the issue that Mike has convincingly argued that on dendrochronological grounds that the GRIP core at this depth is systematically too old by about 7 years, implying that this ammonium signal should be around AD 553. This then explains why there is no Ammonium spike in the GISP2 core at this approximate depth, due to the core being “trashed” at this depth, i.e. the data is missing. So if GRIP is wrongly dated, what are the knock on effects if any? There is a strong argument now that GISP2 is actually a far more robust data set, and that it is extremely accurate in in its chronology. In GISP2 we find the only large ammonium signal in the first half of the 11th century occurring at AD 1021, which is 7 years younger than the largest ammonium signal in the same time period of GRIP, again suggesting that there is an inherent 7 year systematic error in the GRIP chronology. So if this ammonium signal is at 1021 AD, it cannot be assoicated with the AD 1014 Michlemass flood, and nor with any cometary impact at this date. What is strange is that based upon Mike’s suggestions of impact events around 536/540 (which due to Mike’s recent proposal of shifting GRIP counted layers by 7 years younger means that there are two volcanic signals matching dendro-evidence) and at AD 1014, Ted Bryant and Dallas Abbott have found evidences of comet impacts at these dates, even though the dates are now questionable as impact dates. A similar conclusion is found by Ted Bryant with respect to a suggested impact in AD 1491. Again Mike first raised the suggestion of this date being an impact date, due to ammonium in GISP2 as well as a tree ring downturn in Irish Oaks. It also coincides with the closest approach of of any recorded comet (C/1491 B1), on February 20th 1491. This was taken from Don Yeoman’s work, and Bryant used coupled with Australian aboriginal myth to argue of an impact event near Australia, in and around the 20th February (cant remember the precise date). As it turns out though, and what is neglected in this, is that the orbit of this comet is extremely uncertain, meaning it may not have made a close approach at all. All this does not prove that impacts did not occur, but rather one should be skeptical about claims of impacts, and I am personally dubious of any claims of evidence of dated impacts by Abbott and Bryant that have been per-suggested by others. So after that digression, I would say that the foundations of the website’s claims are questionable, and that it is unlikely that these events are separated by 333 years, due to the questionable evidence of impact dates. It would be interesting if it is correct, since an object with an Encke like orbit of 3.33 years, could make close passages to earth every 333 years. I have read that paper, but unfortunately the uncertainty in 14C measurement gives a pretty wide estimate. The age measurement is reported as 950 – 1,170 cal years BP, which is a 220 year temporal window. This is a rather large window to try to fit in a single known date, and it is dangerous to try to fit in the 1014 Michaelmas Flood with the event discussed in the paper. If we assume that they have been good and use the conventional 14C definition of Before Present as meaning before 1950, this corresponds to a calendar date range of AD 780 – 1000 which places it just outside of AD 1014 (but still close enough). Even if they were naughty and used AD 2000 to mark before present (thus dating of 830 -1050), it doesnt detract from the fact that we still have 200 years to fit an impact event into. Personally I would want to see the dating more restrained. While the two events could be linked, the above paper cannot be used to definitively support the claim that they are the one and same event. If we look at the logic of it, if the two events above are linked, and occur in 1014, then we may no reason to allocate an impact origin for it, since the impact marker at 1014 in GRIP ice core could be wrong. If the GRIP ice core is wrongly dated, and the two events are linked, then the principle of least astonishment would tell us that the tsunami may be of terrestrial origin, i.e. no cosmic vector is needed. But is GRIP wrong? Or GISP2? One or both may be since the two cores were extracted 30 kilometers from each other, and so one would think that they should have the same chronology of events. Indeed this is why the location of GISP2 was selected, in an attempt to replicate the GRIP core. so it can be established that the comet was here in 15 a.d.
there was a census in 14 a.d. called by Caesar Augustus? linked in the way different Kreutz sungrazers are linked. and 2012 Jan? Hard to know without an in-depth study but my guess is not. randomly (isotropically) distributed points are within 15 or so deg? coincidence, but not absurdly so. Thanks for this information George. Indeed, with the eccentricity being greater than unity it is hard to see how ISON could be related to C/1680, and that this is likely ISON’s first visit to the inner solar system. I had trouble with the suggestion of a dynamic link between ISON and C\1680 since there is not much out there in the outer solar system (that we know of) that could perturb an incoming e 1 unbound orbit. By this I mean that if there was a group of comet fragments on similar orbits to C/1680 (which seems to be a long period comet), then in order for a fragment on such an orbit to return with an eccentricity greater than unity implies that it most have been perturbed some time after reaching aphelion, since if it was perturbed before aphelion to e > 1 it would not then return. One could always invent scenarios to alter its eccentricity of course, such as a close encounter with an as of yet undiscovered distant planet, but to do so is essentially special pleading. It is a shame that they are likely not related, as it does make for a nice story. Thanks, Jonny. But I cannot claim that cogent comment as my own. It was a response in a private communication I had with a noted astronomer. I took the liberty of posting his thoughts anonymously. As public awareness grows of Comet ISON, your thoughts and his agreement regarding the potential relationship between the 1680 Comet and ISON should prove very informative. Cheers. Hi George, I thought thats what it was given the context. No harm in checking facts or getting a second opinion. Comment: Your input here is great – technical yet clear enough to learn from. Question 1: How precise is the data upon which all those decimal places are determined? Q2: How is it possible to get so many decimal places from 333 years ago? Q3: The e values only differ by 0.00001633964133, which seems really small (but maybe it isn’t with comets). Just to cover this base — Is it possible for Jupiter or Saturn to affect C/1680 on its way outbound that would allow for those values to represent the same body before and after? It doesn’t seem like it would take much to make such a small change in the e value. I have no bone to pick in any of this. The questions are simply for information. Thanks, Steve. Great to see you back. I promise to beat back the chick et al during your stay. Re my 2nd question, I have doubts that an elliptical orbit can be deflected into a parabolic or hyperbolic orbit, but I’d like to know your answer. Thanks! Program Note: I have cleaned up the post here which was quite sloppy. As usual, my apologies for all the typos and other shortcomings. To answer your questions as best I can. Answer 1: Obviously the ISON data is extremely precise, and far more precise than the 17th century data of C/1680. The 1 sigma uncertainty for ISONS eccentricity is 0.000000357. Unfortunately the jpl small body database does not quote the uncertainty of C/1680. C\1680 has the distinction of being the first comet to be analysed using Newtonian dynamics. It was a widely observed comet with teh telescope increasing the accuracy and precision of its position in the heavens. It was first observed on the 14th of November 1680 two weeks before its closest approach to earth (at 0.42 AU) and a month before its perihelion. Its last observation was on the 19th March 1681 when it was at a heliocentric distance of 2.21 AU and a distance of 2.5 AU from earth. Thus it was observed for 125 days. Initially Netwons analysis in the 1680′s could only fit a parabolic orbit to the elements, although he was convinced that the orbit was elliptical. Newtons work at the time was revolutionary, since he worked out an accurate way of determining orbital elements from three observations. However this analysis was in its infancy, and up until the early 19th century there was much disagreement upon the comets orbit (see Marsden BG Annu. Rev. Astron. Astrophys. 2005. 43:75–102). However, in 1818 Johann Encke published a paper (Encke JF. Z. Astron. 6:157 (1818)) in which he took 30 observations from the 125 day observation window (of which we can assume were the most accurate/precise), and determined orbital elements for the comet using much more sophisticated techniques, and it is these elements that we use today, implying that modern techniques make little improvement upon his calculations. How precise these measurements were I dont know. Question 2: How is it possible to get so many decimal places from 333 years ago? Answer 2: The use of the telescope made increased the precision of measurements. Also being such a magnificent sight made it an easier target to measure. It was also observed before and after perihelion which increased the quality of the fit. Also as mentioned above, the mathematical techniques to determine orbital elements had improved significantly by the 19th century when Encke did his calculations, meaning that more precise fits could be achieved for the orbital elements. Question3: The e values only differ by 0.00001633964133, which seems really small (but maybe it isn’t with comets). Just to cover this base — Is it possible for Jupiter or Saturn to affect C/1680 on its way outbound that would allow for those values to represent the same body before and after? It doesn’t seem like it would take much to make such a small change in the e value. Answer 3: You are correct, Jupiter and Saturn could and did affect C/1680. We can go to the JPL small database and get it to calculate the orbital elements for the comet at specific times. This determines the comets elements including perturbations from the planets. The data is listed at the end of this post where I have asked for the elements spanning the time period from first observation until January 1st 1684. Listed is the eccentricity (Ec) and the semi-major Axis (A) of the comet. What we see that after its last observation, its eccentircity as well as its semi-major axis increases until around october 1681, at which point they begin to drop again. As the comet moves out of teh solar system, Jupiter is moving towards its orbit (though the comet is high above the orbital plane. Thus this increase is due to the acceleration of Jupiter which in october passes below the comet around about October. After october, the comet has passed jupiter, but Jupiter starts reducing the eccentricity and semi-major axis, until it starts to settle back towards a constant value. Note after the Jupiter encounter, all other planets are too far away to cause any dramatic effect. So although the elements are being changed by an encounter with jupiter (primarily), what Jupiter gives on its approach, it effectively takes away on its recession. So the comet was not given enough of a kick to change its eccentricity to greater than 1 and hence be ejected from the solar system. This last point is important, and is indeed the most important point of all. Even if it did get a kick sufficient enough to increase its eccentricity of to greater than 1, it would not have come back, since an eccentricity greater than one means that the orbit is now hyperbolic, meaning that the total energy of the body is greater than the gravitational binding energy of the sun/solar system. Another argument is with the semi-major axis. In order to have an orbital period of 333 years and thus be returning now on ISON’s orbit, its semi-major axis should be in the region of 48 AU. It would need a significant encounter in order to reduce a semi-major axis of over 400 AU to 48 AU, and if in such an encounter the acceleration exerted on a body as fragile as a comet may be in excess of its tensile strength. Also, When Encke performed his own calculations to determine C/1680′s orbit, he calculated a period of around 9000 years, but more importantly he concluded that the period of the comet could not be less than 2000 years. “The first sungrazing comet to have its orbit computed according to the law of gravitation was in fact the first comet of any description to be treated in this manner, namely, the great comet of 1680–1681, now designated C/1680 V1. The parabolic orbit published by Newton (1687) as the illustration of his geometrical method for making such computations from three observations indicated a perihelion distance q of 0.0059 AU (or 0.3 R above the sun’s surface), some 5% smaller than the value later determined by Encke (1818) from 30 observations. Newton and Encke agreed that the orbit had an inclination i of 61 degrees to the ecliptic. Although the success of Newton’s calculation of a parabolic orbit did much to clarify the idea that comets were, like planets, material bodies that moved in accordance with his laws, several of his contemporaries were already reviving the views of some of the ancients, such as Apollonius of Myndos and Seneca, that— again like planets—comets had relatively short orbital periods, that the total number of discrete comets was therefore not enormous and that, in particular, one could readily identify different apparitions of the same object. One such contemporary was Cassini, who, simply by comparing the observed tracks of comets across the sky, concluded that the 1680 comet, for example, was a return of the famous one observed by Tycho Brahe and others in 1577 (Cassini 1699). Although Newton had also noted some vague similarity between the 1680 and 1577 comets, the Newtonian orbit computed by Halley (1705) for the latter showed q to be as large as 0.18 AU, so the proposed relationship was clearly incorrect. As is well known, Halley himself instead linked the 1680 sungrazer with a comet (also mentioned by Newton as having been very close to the sun) seen in 1106, convincing himself and others of its 575-year period by also remarking on comets recorded in the years 531 and 44 B.C. (or −43). But Encke (1818) computed for C/1680 V1 an orbital period P of almost 9000 years—and concluded that P could not be less than 2000 years. Furthermore, the scanty data made it impossible for Halley to compute orbits for any of those earlier comets. Like Cassini’s, Halley’s scenario is therefore now discredited (cf., e.g., Marsden 1997). With regards your doubts about elliptical orbits being deflected into parabolic or hyperbolic orbits. It is thought possible (to my knowledge anyway) that comets can be deflected into parabolic or hyperbolic orbits, if it is given enough of an energy boost by another object (such as jupiter). Orbital elements for C\1680 V1 from 1st November 1680 (2334972.5 Julian) to 1st January 1684 (2336128.5 Julian). Ec = eccentricity, A = Semimajor axis. note scientific notation is used. The above post is a bit clumsily worded in parts, for which I apologise and blame the headache I was suffering from, and the two kids distracting me (the two phenomena may even be correlated!). There is a review paper out (2013) by Boslough et al. on the Younger Dryas impact hypothesis if anyone is interested. I only read the abstract so I can’t comment. But I can comment on impact fluxes and I appreciate the work you guys are doing attempting to correlate impact markers and proxies to the lesser impacts that we know must be occurring aperiodically through time, which would presumably leave atmospheric traces that would be amenable to some sort of correlative investigation. On the YD I remain ambivalent. Continuous fresh water NADW formation forcing from ice sheet decay seems to be required, and any large impact at that time may indeed have been coincidental unless it occurred directly in the Laurentide ice sheet in some opportune spot. It still seems premature to pronounce it dead, but something definitive needs to be forthcoming or else it is indeed dead. Not to imply a dead hypothesis isn’t useful, as this is one hypothesis that has been very useful across a variety of interrelated and not so interrelated scientific disciplines. I think it is up to the principles to declare this hypothesis dead when or if that time comes, and I honestly don’t think that would be anything dishonorable. It would also be nice to see something a little more definitive in terms of dating on the Corossol impact crater in the Gulf of St. Lawrence, which is an indisputable astrobleme of a relatively early age, not yet known to any precision. This was a passing thought and amounted to “stream of consciousness” at the time, and upon further considerations is probably not an accurate statement, so please disregard. My apologies for such a comment. Jonny – What part of that was incorrect? It certainly seems it would take a significant encounter to change the semi-major axis that much. My thinking is that with such a high inclination it seems that it can’t BE in position to so a major encounter – by the time it is out as far as Jupiter or Saturn it is far, far out of the ecliptic. Yes? With 60°-61° it spends almost no time near any planet’s orbit. Am I wrong? Steve, the part about being inaccurate is the idea that the comet would be pulled apart for having an encounter where its semi-major axis would be altered from the region of 400 to about 50. It was a sort of top of the head argument before I thought it through completely, and I dont have any evidence for it. It may be possible, or it may not be, but the truth is, that on second thoughts about teh statement, the statement may not actually be true, hence why it is inaccurate. 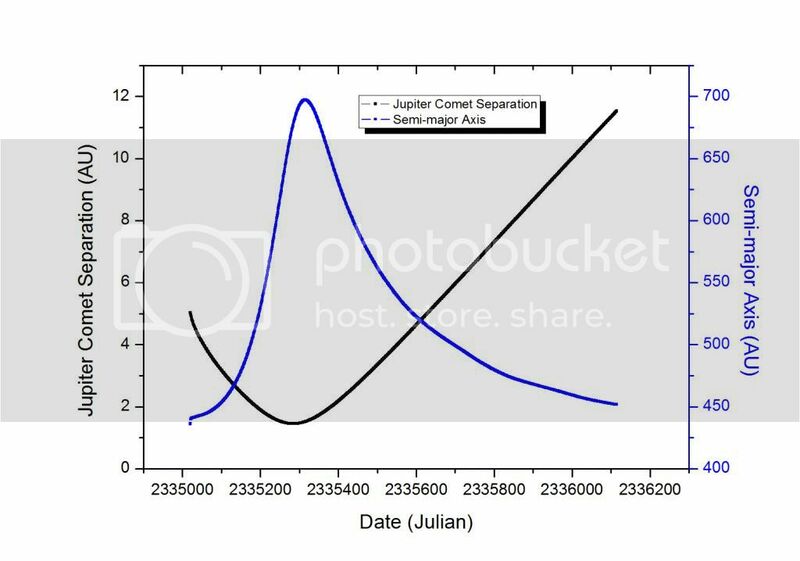 For example, you look at the change of semi-major axis for C/1680 V1 it goes from ~450 to ~700 and then back again with its encounter with Jupiter on its outward journey. This is approximately the same magnitude of change as going from ~450 to ~50. We have no evidence that it was destroyed or not at this the encounter with Jupiter. Thus I would suggest that my original statement be disregarded as an erroneous thought process. How far a comet is above of below the ecliptic plane at the distance of Jupiter depends upon the inclination, but it also depends upon other factors of its orbit. For example, the asteroid/comet 2003 EH1 has an inclination of about 70 degrees, but it has a node close to the orbit of Jupiter. Therefore the orientation of the orbit with respect to the ecliptic plane can effect the distance at which an object passes above the ecliptic plane at the distance of Jupiter’s orbit. Also in some cases a large eccentricity (implying that the ratio of semi-minor axis to semi-major axis is small) then the comet can remain near to the ecliptic plane even with a large eccentricity. For example, even though C/1680 had an inclination of about 60 degrees, it actually only about 1 AU above the ecliptic plane at the orbital distance of Jupiter. If Jupiter happens to be close at this time, then it can effect the comet. I have done a more detailed calculation of minimum pass distance of Jupiter for C/1680. 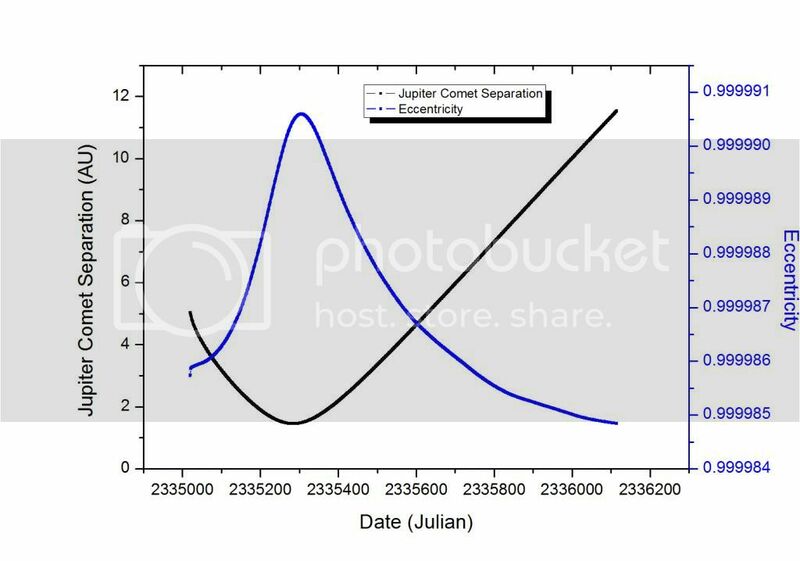 In the previous graphs the separation distance is not correct as it was based upon a rather simple (and quick) assumption and didn’t take into consideration the 3 dimensional positions of Jupiter and the comet with respect to each other. Basically i located Jupiter in 3d space, but just used the heliocentric comet distance. While this gives the feel of the situation, it produces a minimum separation that is too small in size (0.123 AU). If we use the correct vector summation then we get the following graphs (again using JPL’s Horizons application to generate the data from 18th December 1680 to 18th December 1683). These graphs demonstrate that even though the minimum separation between Jupiter and C\1680 was 1.455 AU, it still affected C\1680′s orbital parameters (if temporarily). Further more, around this close approach it spends about 50 days at a distance less than 1.5 AU from Jupiter. In principle though, comets that are highly inclined to the ecliptic have less encounters with Jupiter than ones that orbit close to the ecliptic plane, but it is not explicitly the case that high inclination orbits cannot have close encounters with Jupiter. Thanks, Jonny, for your extra work and your excellent info. Your last sentence is what I’d gathered from your previous info, plus thinking about it in 3D as best I could. The latest now is that the 775 tree ring event MAY be linked to a highly focused cosmological gamma ray event related to the merger of heavy bodies. I guess time will tell, with only a single data point, but another paper claims that solar energetic particles will not be of the flux necessary to do the job. I don’t have any links available at this time, sorry. “This year the Northumbrians banished their king, Alred, from York at Easter-tide; and chose Ethelred, the son of Mull, for their lord, who reigned four winters. From the recent Gamma ray burst paper, from my understanding of the paper, the researchers were looking for a mechanism that could generate gamma rays without a visible supernova. The issue seems to be the belief that no supernova was observed/recorded at the time, hence the different hypothesised scenarios. Indeed, in the outset of the recent paper, the authors construct their argument that a supernova capable of producing enough gamma rays to explain the 14C excess should have been within 260 parsecs (about 850 light years), and so should have been visible. In order for it to remain undetected there would have to be extreme optical absorption, which would be impossible for the distance, ergo it was not an ordinary supernova, and must have been something else. But what if it was observed and recorded, for example in the sources of Roger of Wendower or the Anglo-Saxon Chronicle, or has not been recognised as being recorded, then a normal supernova should still be on the table.